High-resolution photographs of the shuttle Atlantis' underbelly shot today during final approach to the international space station show the orbiter's heat shield tiles are in good shape with no obvious signs of damage. Agency engineers decided late today that additional heat shield inspections, a move that would have triggered a one-day mission extension, were not required. While NASA could still extend the flight if problems are encountered attaching a new solar array to the space station, the current plan is to stick with the pre-launch timeline. "The initial report is all the tile on the undersurface of the vehicle looks great," John Shannon, chairman of NASA's Mission Management Team said earlier today. But analysts did spot three protruding gap fillers, thin spacers between tiles, that worked themselves loose during ascent. Two of the exposed gap fillers are on the doors covering propellant feedline fittings just behind the main landing gear doors. The gap filler on the port door "is almost gone, it is barely hanging in there by one little corner," Shannon said. "The one on the starboard ET door side looks like it was ripped away, it's a very, very small protrusion." The third exposed gap filler is located on the port wing and sticks up about .15 inches. During the first post-Columbia shuttle mission, STS-114, a spacewalking astronaut pulled two protruding gap fillers out to make sure they would not trigger turbulent flow early during re-entry, which can cause higher downstream heating. Another worrisome gap filler was spotted during Discovery's flight in July on mission STS-121. Located near one of the external tank feedline doors, the gap filler was left in place and while higher downstream heating was observed during entry, it was well within the shuttle's design limits. Another gap filler was left in place extending above the surrounding tile on one of Discovery's wings. It happened to be located near a temperature sensor, which allowed engineers to improve computer models used to predict the onset of turbulent flow. "None of these really concern the team a great deal at this time," Shannon said of the three gap fillers noted on Atlantis' belly. "The one on the external tank door is very similar to the one that was cleared on STS-121. The team is going to go through the normal process of looking at that and when it might trip the aerodynamic boundary layer and cause some additional heating. "The process we honed on STS-121 to understand the impacts, the team will go through that and we'll get a report in subsequent days whether that will be any kind of impact to us. I do not expect it to be." 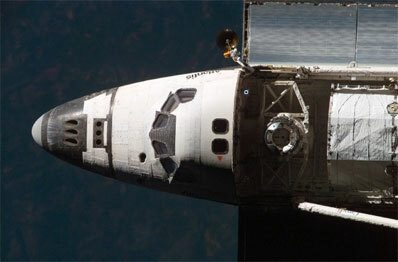 On Sunday, the astronauts carried out a now-standard close-up inspection of the shuttle's wing leading edge panels and nose cape, the areas that experience the most extreme heating - more than 3,000 degrees Fahrenheit - during re-entry. Shannon said engineers identified 495 "regions of interest." Of that total, 116 were immediately eliminated because they were present in pre-launch photo documentation. Another 318 were determined to be benign. That left 61 that were still under discussion today, "which might worry you, but what that means is that's just another level of looking at where it is, what kind of heating would happen during re-entry in that area and then deciding whether it was something that needed to be looked at further or not," Shannon said. Late today, the engineering community decided no additional inspections were needed and that Atlantis' heat shield is in good shape for the trip back to Earth Sept. 20. Shannon said the numbers were similar to what was observed during the first two post-Columbia missions. The big difference this time around is that NASA's post-launch engineering teams now have flight experience and actual flight data to feed back into the process. The result is a more streamlined operation. "This is just standard work now," Shannon said. "Things that were a surprise to us on 114 or 121, it's now standard work. From a process standpoint, we're not surprised by any of these things and we know what to go do to analyze it. The other piece that's really critical, we have real flight data now. ... And we found out our models were fairly conservative." The result is more confidence about flying the shuttle and maintaining flight safety. "This is a really challenging mission from a space station assembly standpoint," Shannon said. "It was so beneficial to us to fly 114, to fly 121, to see these things, to be able to grapple with them and not have the complications of an assembly mission on top of that. "We learned so much, we learned how to do it, we learned who needs to know what (and) when, how to hand off data from one group to the next and it's just a very fluid process right now. ... I am very confident in the team and our ability to support the rest of ISS assembly. It's been a good learning experience in the last two flights."